Manaphy's official artwork from Pokémon Diamond and Pearl. Manaphy (マナフィ, Manaphy) is a fictional creature from the Pokémon franchise. 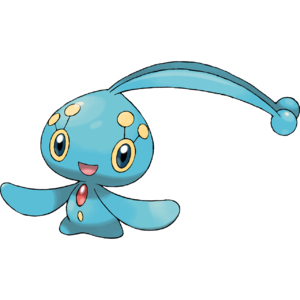 Manaphy is a Water-type event-only Legendary Pokémon introduced in Generation IV, and is categorized within the Pokédex at #490 as the "Seafaring Pokémon". It is notable for being, along with Phione, the only mythical Pokémon able to breed, producing Phione eggs. As well as originally being needed to have completed a Ranger Net mission in the post game from either Pokémon Ranger or Pokémon Ranger: Shadows of Almia to receive its egg in the main Generation IV games. Heart Swap is a Psychic-type move, exclusive to Manaphy (prior to Generation VII), which makes the user and the target swap their stat changes. When Manaphy appears from its Poké Ball it uses its signature move Heart Swap, temporarily swapping the bodies of 2 players. This can be dodged via a properly timed air dodge. During the heart swap, the players keep their own damage and stocks, and self-destruction causes the player to lose a stock, not the opponent. The only thing that is kept with the body is the ownership of Poké Ball Pokémon and characters from Assist Trophies. Two players need to be close to Manaphy in order for the Heart Swap to take effect. In the very unlikely case of two Manaphy appearing together, the first Manaphy's Heart Swap is canceled when the second one is activated. The Permanent Heart Swap glitch causes the effects of Manaphy's Heart Swap to last for the entirety of the player's stock. If a player under the effects of Heart Swap is KO'd and has no stock remaining, the player they switched characters with will be forced to remain as that character. Once the second player is KO'd, he/she will reappear as their original character. No longer a Poké Ball summon, Manaphy appears on the Kalos Pokémon League stage as a rare stage element. Occasionally appearing in the Flood Chamber, it will cause the central platform to turn into a whirlpool which pulls fighters down towards the lower blast line. Manaphy's trophy is exclusive to Super Smash Bros. for Wii U, where it is part of the Legend of Pokémon Diamond & Pokémon Pearl Trophy Box. This Water-type Pokémon is said to have the mysterious ability to bond with any other Pokémon. It's also said to appear occasionally in the Water-type Elite Four Trainer's room in the Kalos Pokémon League stage. When it appears, it'll use its Whirlpool move to drag fighters into the centre of the swirling waters. Manaphy once again appears on the Kalos Pokémon League stage. 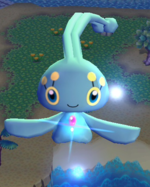 Its behavior is the same as it was in Super Smash Bros. for Wii U.
Manaphy also appears as a Spirit. In its Spirit Battle, it is represented by Squirtle. Manaphy's official artwork from Brawl. Manaphy is one of two Poké Ball Pokémon (but the only legendary) to use a signature move that later became non-exclusive to it. The other being Meowth. This page was last edited on April 14, 2019, at 18:37.